Spoiler: RYAN DUNGEY IS YOUR 2015 450SX Champion. Like Cooper Webb before him, Dungey’s road to a second 450 title was pretty clear entering Houston. The Dunge had an eighty-point lead entering the night, meaning if Eli Tomac won, Dungey would still have clinched with a third or better. Dungey was brilliant this season and rode another to another podium finish—his thirteenth in fourteen rounds to clinch the title. Dungey’s title overshadowed a career first for Cole Seely, won took over the lead from Andrew Short early in the race and cruised to his first career 450SX win. As for Short, he held strong all race before being passed by Tomac for third. He finished sixth. For a moment, it looked like Chad Reed and Jason Anderson would occupy the podium behind Seely, but the two came together in the corner after the finish and both went down. Anderson would go down again and finish sixteenth. Reed would bounce back for fifth. Reed’s teammate Josh Grant was strong again, holding off Reed for fourth. 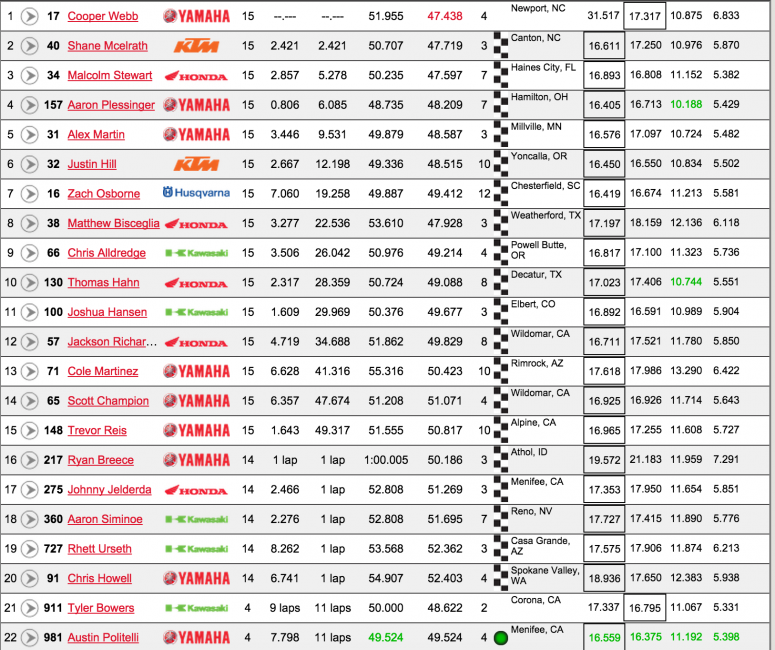 Davi Millsaps, Broc Tickle, Justin Barcia and Justin Brayton would round out the top ten. Spoiler: COOPER WEBB IS YOUR 2015 250SX WEST REGION CHAMPION. In his second supercross season, Webb has his first career championship following his fifth win in seven rounds. When Jessy Nelson pulled out earlier this week following a crash testing, Webb’s road to his first title got that much easier. He didn’t need a win to clinch—even with a Tyler Bowers win, a fourth would have gotten the job done—but it was within reach and he took it. Shane McElrath got a fantastic start from the way inside to take the early lead. GEICO Honda’s Matt Bisceglia was a close second with Bowers and Webb following. Webb went on the attack early, getting past Bowers and then Bisceglia. Once past Bisceglia, a clear track stood between he and McElrath and he quickly gobbled him up. He would stretch his lead to 2.4 at race end. McElrath held on for second. Malcolm Stewart overcame a bad start to work his way into third. Webb’s teammate Aaron Plessinger would finished fourth. 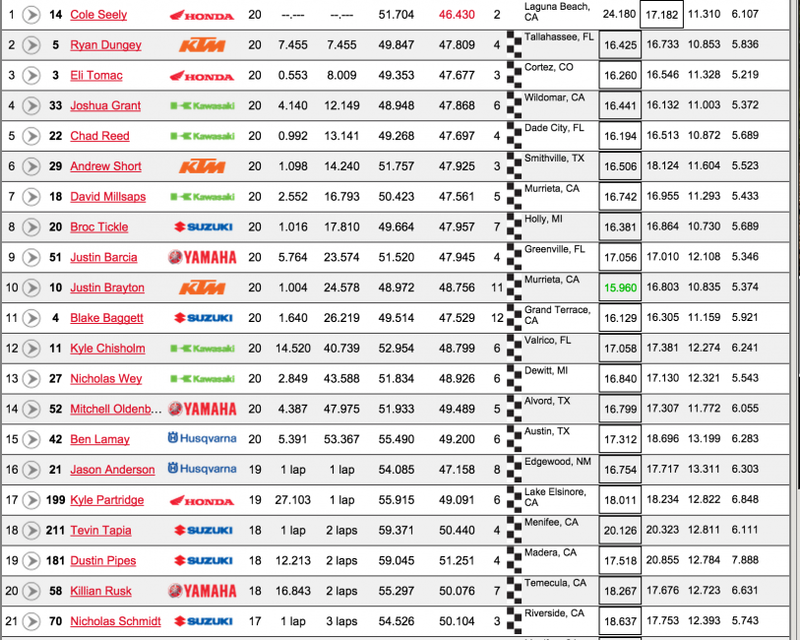 Alex Martin, Justin Hill, Zach Osborne, Bisceglia, Chris Alldredge and Tommy Hahn would round out top ten.